An exact cause is unknown; however, the upright posture of humans alone forces a great deal of pressure on the rectal veins, which sometimes causes them to bulge. Ligation – the rubber band treatment – works effectively on internal hemorrhoids that protrude with bowel movements. 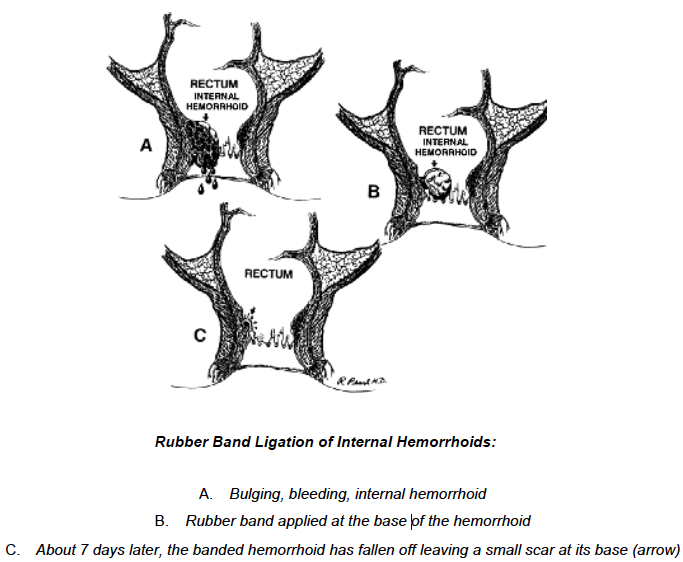 A small rubber band is placed over the hemorrhoid, cutting off its blood supply. 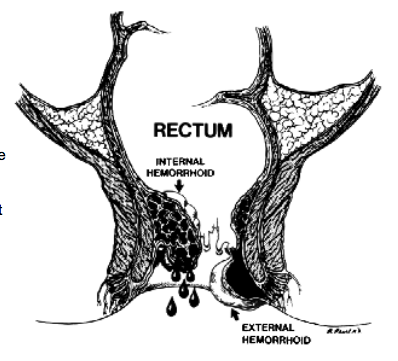 The hemorrhoid and the band fall off in a few days and the wound usually heals in a week or two. This procedure sometimes produces mild discomfort and bleeding and may need to be repeated for a full effect. Hemorrhoid stapling – this is a technique that uses a special device to internally staple and excise internal hemorrhoidal tissue. The stapling method may lead to shrinkage of but does not remove external hemorrhoids. This procedure is generally more painful that rubber band ligation and less painful than hemorroidectomy.